INSERTEC will participate as Bronze sponsor in World Foundry Congress, which takes place at Bilbao (19 – 21 of May), we will be proud of your participation!!. 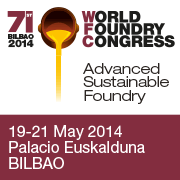 The Tabira Foundry Institute, the World Foundry Organization and IK4-Azterlan would like to invite you to participate in the 71st World Foundry Congress that will take place in Bilbao (Spain), from May 19th-21st 2014. For many years, the foundry industry has played a determining role in the economic and social development of civilizations. Contemporary demands and requirements from current society drive and inspire experts in the search for new technological advances. The different activities gathered within the Congress and the International Foundry Exhibition will represent an extraordinary opportunity to exchange technical knowledge and to build personal and professional relationships with the common goal of a prosperous and sustainable future. This international event will take place in the city of Bilbao. A living metropolis, where the different historical, industrial and economical trends are reflected in its magnificent architectural styles. Always open to visitors and ready to share its extensive cultural offerings, well recognized gastronomy and sincere hospitality. We look forward to seeing you in Bilbao in 2014. 27th of January we have received the visit of our friends Steve Cherico (President&CEO), Gilles Mercier (Industrial Sales & Marketing Manager) and David Jarvis (Area Sales Manager Europe) from WHAL REFRACTORIES (USA). 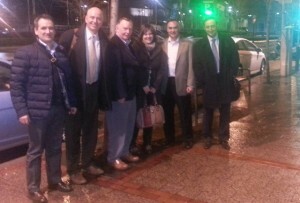 For Mr. Steeve Cherico & Gilles Mercier were their first visit to INSERTEC. During our meeting, we have talked about topics of common interest and confirmed the vision of both companies to continue working more closely in our technical and comercial development. INSERTEC is pleased to have participated in 10th edition of the renowned EUROGUSS International Diecasting Congress and Exhibition hold in Nuremberg between the 14th and 16th of past January. Our colleagues Oscar Iribarren, Gorka Fernandez and Santiago Michel have attended a good number of local and international Customers from the INSERTEC stand, in Hall 7. They have presented our latest developments in equip ment for the Aluminium foundry, such as melting, holding, dosing, heat treatment and recycling furnaces, as well as our services for the repair or refurbish existing installations linings with refractory solutions based in precast shapes or with monolithic masses. Many of the visitors were just from Germany, but there were others from Sweden, Bosnia Herzegovina or Turkey, or even from far away areas such as Korea or Algeria. There have also been of course opportunities to meet friends, colleagues, partners, suppliers, and even competitors, in a professional and well organised event. Nuremberg atmosphere, even in winter time, and the show organisation have enhanced these encounters. As always, a great pleasure!! Besides, the good number of enquiries received shows that the Aluminium foundry has still growing possibilities in central Europe for attending a demanding market, in terms of volume and quality, as well as the recognition of INSERTEC equipment and service value. This word “CRISOL” (Melting pot), designates certain bowls or refractory vessels used for melting materials at high temperature. Some theories suggest its origin in the ancient catalan word; “CRESOL“, and this from the vulgar latin “CRUCEOLUM”. Also, is used to indicate a land or community that has been the scene of mixture, fusion of diverse cultures, trends or religius traditions. Fire always purify and combines the best of people, of civilizations, of wisdom.